Stuff Points: Earn 150 points when you buy this stuff. One of the strongest and most versatile working surfaces on the market, this fixed workbench will help you eliminate clutter and improve productivity. It's made from industrial strength steel, and it can hold up to 400 pounds, so it's tough enough for commercial applications and home use alike. The four foot wide bench provides plenty of work space when mounted down low, and it acts like a shelf when mounted higher up. The horizontal bar underneath the bench is home to three different rubberized hooks that can be used to hang, store and organize all sorts of stuff. 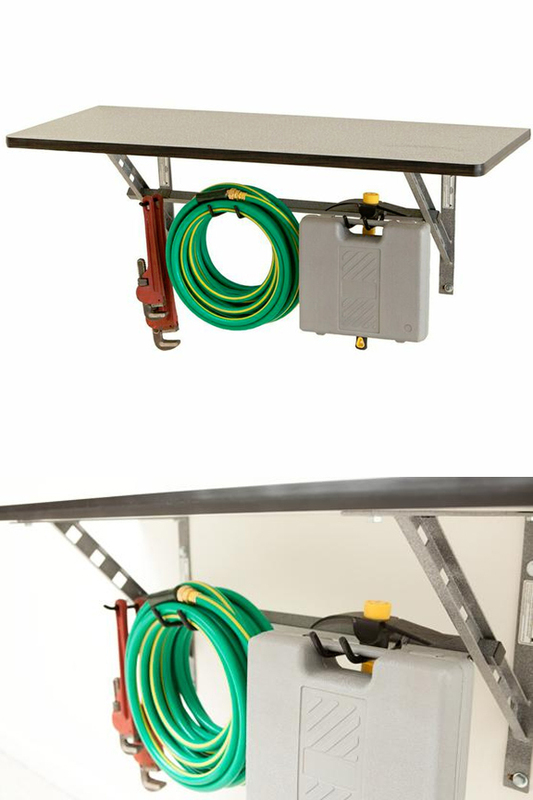 Give yourself a spot to work where space is limited, design a more efficient workshop, reduce clutter in your garage, or add beefy shelving with integrated hooks to improve your shed or basement. The melamine bench is a full one inch thick, and it's banded all the way around to prevent damage and chipping over time. All of the mounting hardware you need is included, and putting it on the wall will take most people less than fifteen minutes. Stop repairing things on the floor, or doing projects on a folding table. Add some professional grade work space to any location of your home, and reduce frustration while eliminating clutter and making any job easier to handle. A large 18" x 48" bench or shelf gives you plenty of space to store things on top. On the underside, three integrated hooks provide even more room to hang additional stuff. All combined, you can store, hold, hang, or work on up to 400 pounds of whatever you like. Two 16" brackets will mount the bench to the wall. It sits on top almost like a regular shelf bracket. On the underside, you'll install the horizontal bar in the location of your choosing by sliding it through the holes on the diagonal portion of the brackets. Once the horizontal bar is securely in place, several rubberized hooks will lock on to provide even more storage. Use the top surface for working, or mount it higher for use as a shelf. Commonly used tools and other objects can hang neatly underneath for easy access and increased organization. Versatile. A shelf or a workbench? You be the judge. Mount it high or low depending on your needs, and use it for working, for storage, or for both. The integrated hooks can hold a wide variety of objects, and the large surface on top is perfect for any number of uses. Durable. Commercial strength for a lifetime of service, this bench can handle anything you throw at it. You won't find flimsy metal, or laminated surfaces, but you will find industrial strength steel and a thick, long lasting work surface. Store anything that fits, use for all sorts of work, pile on up to 400 pounds, and never worry about damage. Powder Coated. As if the commercial grade steel was not enough, each piece is also completely coated for added durability and a great looking finish. You won't have to worry about unfinished materials that age quickly, or painted pieces that chip scratch or wear over time. Easy. Simple to install, and easy to use. 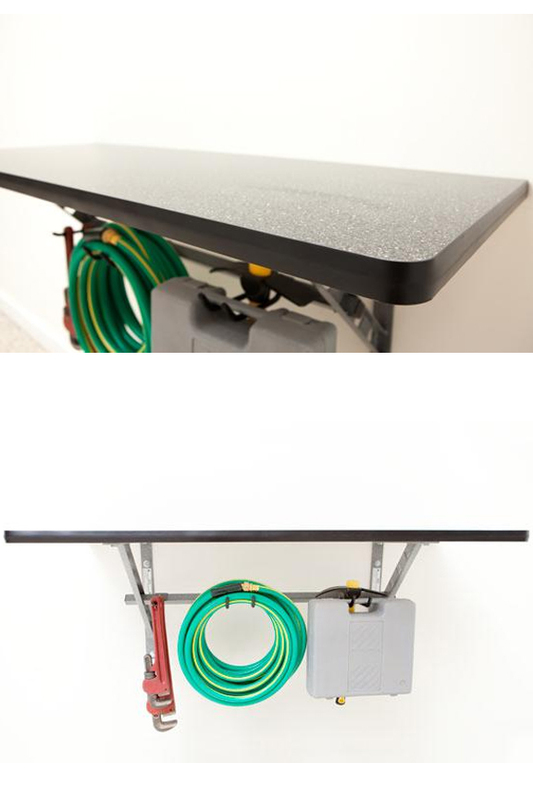 This wall mounted work bench is one of the best and most simple ways to increase work space or de-clutter your garage. Most people can install it in a matter of minutes thanks to the limited number of parts, and simple instructions that are included. Effective. Super strong and fully able to do the job intended. Once installed, this product will provide valuable space for working, and also room for storing tools and other stuff when not in use. Give yourself one of the best ways to expand your workshop, or organize a project room, and never worry about it failing over time. Uses Use as a storage shelf, or use as a working surface for projects and repairs. It mounts easily to any wall, and provides four feet of linear space for any number of uses. A variety of hooks underneath allow you to store tools and other stuff to keep it neat, organized, and handy. Compatibility Hold almost anything. Works with any stuff that fits. Capacity Hold up to 400 lbs. Hooks Included Comes with (1) 5" hook, (1) 5" double hook, (1) 5" wide hook. Hardware Included Yes. (2) 16" mounting brackets, (1) 35" bar, and (1) bag of hardware. Rubber Coated Yes. All hooks have an added coating for durability, functionality, and to protect your stuff. Edge Banded Yes - The melamine bench is built to last, and designed to prevent chipping and breaks. Organize your garage, improve your basement, or set up a workbench where space is limited. This sturdy storage solution gives you four feet of flat surface to work on, and it also has hooks to hang stuff underneath. Eliminate clutter and improve productivity with this useful product. Order Yours Today!